This Friday, the Celtic Arts Society will welcome one of the finest assemblages of world class Scottish performing artists to Seattle. And yes, there will be lots of men in kilts! Traditional bagpipes, borderpipes, smallpipes, fiddles, drums and dancers will all descend on Seattle’s Benaroya Hall for one night only at the highly anticipated Masters of Scottish Arts Concert. The Scottish people have a reputation for fun and celebration, and this concert will likely be described as such. The Celtic Arts Foundation (CAF) is based in Washington. They produce Scottish, Irish and Celtic cultural events, provide scholarships to aspiring Celtic artists, and have an international focus. Of the pipers, Fred Morrison’s unique free-flowing yet expressive abilities on the Scottish smallpipes are in sharp contrast with the award winning Dr. Gary West, whose impressive knowledge of Celtic folk music and bagpiping history is not to be ignored. 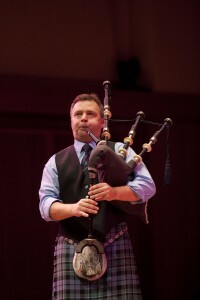 Match them with Roddy MacLeod, MBE, one of the most successful piping competitors on the circuit today, and this will be an unforgettable evening of pipes.